I have been a private banjo instructor for over twenty years. In that time I have developed teaching methods covering all the techniques needed for a student to become an accomplished clawhammer player. A visit to my clawhammer page will give you an idea of the number and quality of my teaching materials and arrangements. After my students master the basic techniques, we start working on "Arrangement Development" (how arranging music. My goal is to get my students to that level where they can take any song and create their own banjo arrangement from scratch. No musician should have to rely on another player's arrangements (tablature) forever! The cost of a 40 minute private lesson is $30.00. I teach on Tuesdays and Thursdays in Harrisville and Mondays in Salt Lake (It may be difficult to get into one of my Monday lesson spots as I only teach the one day in Salt Lake). - Check my Teaching Schedule for available slots. - Download and read my Lesson Policies. - If you are still interested lessons (or a personal workshop), contact me. I've had numerous players asking for single, intense, one-on-one lessons and have finally decided on a format for these requests. If you are teaching yourself the banjo by working through the tabs on my website, or are an intermediate/advanced player who just wants an occasional "brush up" lesson, you can schedule a "personal workshop". This option is available for internet students using Skype or FaceTime and is also available at my home in Harrisville. The cost is 100.00 per session (they usually run a little over two hours in length). 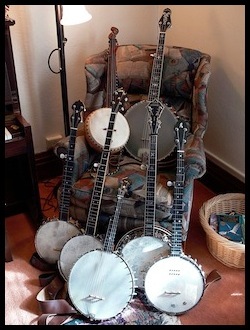 • They are only available for those who are already playing some clawhammer banjo. Participants should be able to play at least a couple of clawhammer pieces from memory. • These sessions usually run over two hours in length, which gives us plenty of time to evaluate playing technique and come up with appropriate corrective exercises if needed. I expect those participating to use some sort of recording device (camcorder, smart phone, digital recorder for sessions at my home. Video capture software (such as Viola) if we are using the internet. To schedule internet lessons (or personal workshops), contact me at: (801)782-0534 or through the contact page on this website.